Today is a rather special day for me. Baekdal Plus, the subscription part of this site, is now five years old, which is pretty crazy to think about (the site itself was launched in 1999 and turned into a magazine in 2004). Five years ago, I decided that I would try to do the impossible. I would setup a subscription based magazine about the future of media, which, at the time, was the most insane thinking possible. Remember, this was one year before sites like the New York Times started thinking about it. This was back when everyone said that the internet should be free and just monetized by advertising. This was back when everyone said that abundance would make it impossible to ask people to pay for content online. And here I was, a person running a blog, deciding that going PRO was a good strategy. People said I was nuts. People said it would never work. And several of my friends suggested other ways for me to make money. And, to be honest, they were almost right. The past five years has been a roller coaster ride in the extreme. I very nearly went completely bankrupt, twice. I was so close to going bankrupt that I was working on contingency plans, and at what point I would have to 'give up' before it put me into a financial ruin. And that day came. I reached that point where I had decided I had to give up (which was when I only had two months worth of cash left in my bank). And I almost did it. I almost closed my company. But something inside of me told me to keep going. And, well, here we are at the five year point. Mind you, I'm not getting rich doing this. I'm cash-flow positive and 2015 is actually looking great. My subscriber base is up about 20-30% year over year (I haven't audited the numbers yet), and my consulting business, where I mainly do strategic reviews for big publishers, has gone up quite a bit this year. That said, I'm still nowhere close to where I thought I would be. Back in 2010 when I started Baekdal Plus, this site had more than one million monthly uniques. And the larger publishing houses predicted (based on studies they did) that 1% of their audiences would subscribe. So, if 1% of my uniques subscribed, I would get 10,000 subscribers the first year and make $90,000 per month. That didn't happen, of course. In fact, only 29 people subscribed over the first three months. That gave me a monthly income of only $144. Today, of course, I have a lot more than that. But that was an extreme wakeup call. What happened there was a painful lesson in the difference between high-intent and low-intent traffic. I had been very good at building up traffic, but it was the low-intend type that didn't convert. And this is something I see all the times with my clients too. Most publishers are focusing on optimizing for more pageviews and more traffic, which is great if you can take that to a scale where advertising actually works. But, if you are a niche magazine, digital advertising isn't going to be enough. You need other income streams, like doing digital subscriptions or other things. But that's not going to happen if your traffic is the low-intent type driven by social shares and snacking. I learned this the hard way, but I'm seeing exactly the same problem with my clients. BuzzFeed, for instance, (not a client) is very good at driving traffic with articles and videos about how Disney princesses would look if they were real. This video, for instance, has 50 million views on YouTube. It's absolutely stunning from a traffic perspective. But it's the low-intent type of traffic. None of these would convert into paying subscribers if asked. BuzzFeed makes this work because they have so much scale and because they are so random. They are the exact opposite of a niche. They have no focus. They have no editorial purpose (other than to optimize for more low-intent content). It's not that their articles are bad (some of them are quite good), it's just not content that people read for a reason. BuzzFeed is the modern equivalent of MTV. But none of this works if you are niche magazine. A niche magazine can't get the same level of scale, because, being niche, means you have to target your audience. Without the scale, advertising doesn't really work because you can't get the right volume. And without that volume, you have to turn to other options and operate under different expectations. This is what I see with all my clients, and this was what I learned myself here on this site. The intent of your audience defines whether your strategy is going to work or not. For this site, it meant dramatically rethinking how I did things. The first thing I did was to move Baekdal Design (a section on this site designed to inspire people to think in innovative ways) over to a new and separate domain (which I called42concepts ... which I'm no longer doing anything with). In the past, Baekdal Design was intended to drive traffic to this site, which I would then convert into paying subscribers with my Plus content. It was the freemium model. What I realized, though, was that the exact opposite was happening. Baekdal Design encouraged people to merely snack on random content, which removed their intent, and this made it harder for me to convince people to buy a subscription. "Why buy a subscription when most of the articles are just snacks?" They said. There was no distinction. No clear focus of value. So Baekdal Design had to go. This of course meant that I was removing most of the social traffic I was getting. I went from 1 million uniques per month to about 100,000 uniques (a 90% drop in traffic) and today it's even lower than that. The upside was that my subscription rate went up. But still, it wasn't enough. Most of my articles still weren't distinct enough, and the most common feedback I was getting was "why should we subscribe to Baekdal Plus, when we can read the same thing on hundreds of other sites?" So, over the past five years, I have continually worked on making my articles distinctive from everything else that you can read online, and let me show you some interesting numbers that illustrate this transformation. 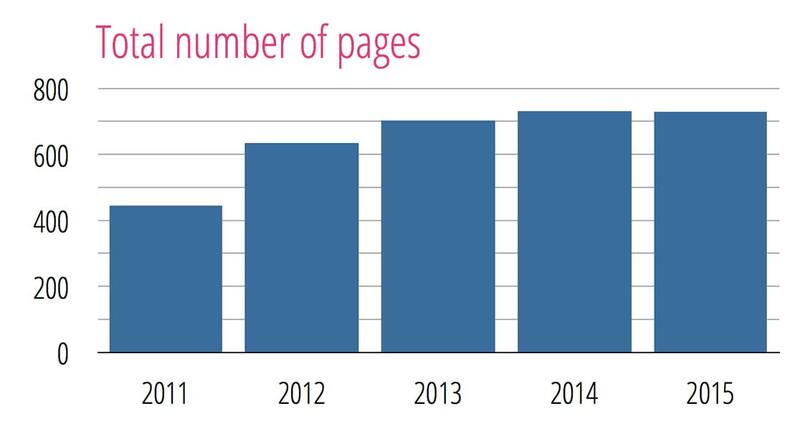 If we look at the number of Plus articles posted per year, we see that I'm posting fewer and fewer articles. In 2011, I posted 36 Plus articles, while in 2015 the number is down to 25. This might seem strange. Why would people subscribe to less, you ask? Right? Well, because you are not. You are actually getting more today than in the past. And the way to illustrate this is to look at the length. 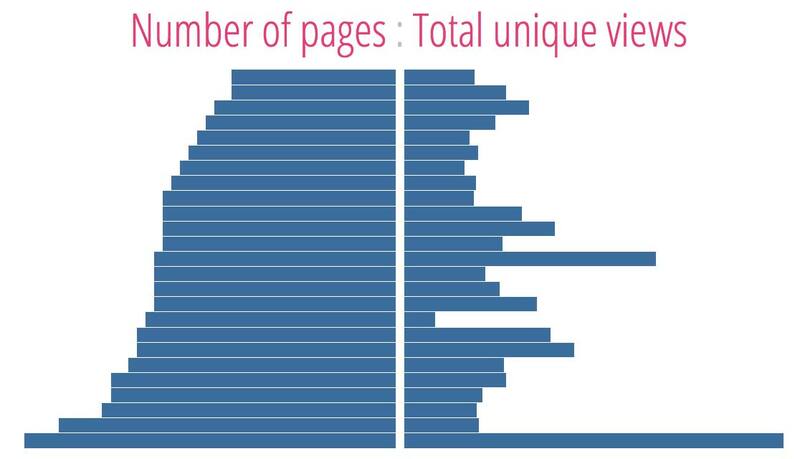 We can either look at the total number of words published, or the total number of pages. 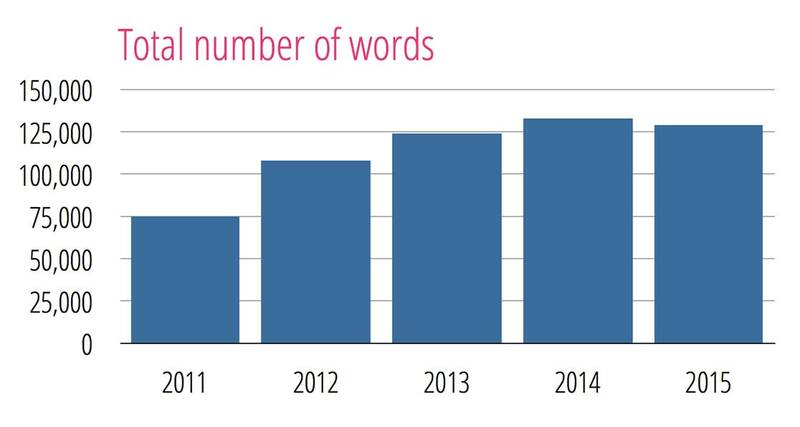 In 2011, I posted 36 articles containing a total of 75,000 words. While in 2015, I have posted 25 articles containing a total of 130,000 words (or 730 pages). So, you get less articles per year, but with 75% more content overall. We see the same thing if we look at the length of each individual article. 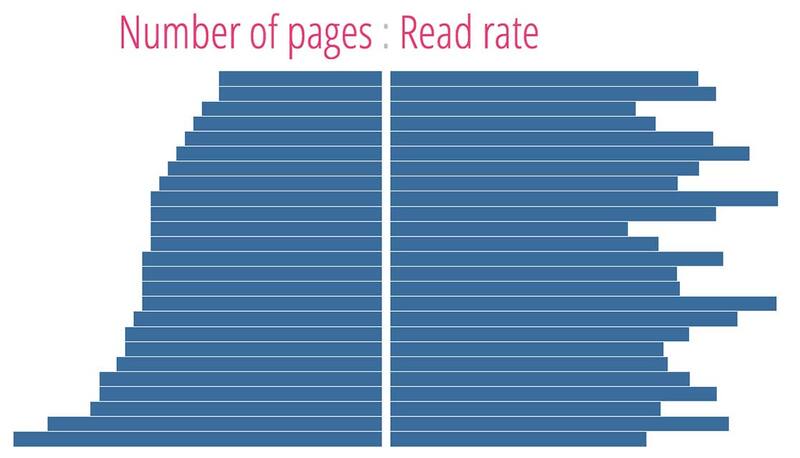 In 2011, the average length of an article was only 12 pages long. That's still long compared to most articles online, but it's not enough to really make a difference and to get you into the thick of the trends I'm writing about. So, today, the average article is 28 pages long, more than double the size, which allows me to add far more details, insights, and perspectives into each one. This is a big reason why Baekdal Plus works today. I have shifted away from focusing on volume and is now entirely focused on creating value with each individual article. Each one has to be able to stand on its own. Each one must deliver the value that it promises. But more to the point, I have focused Baekdal Plus on just the right type of audience with the right type of intent. My current level with 25 articles per year and 25-35 pages per Plus article is also my aim for 2016. It's a good level because it means that each article takes about 20 minutes to read. Mind you, I'm not really designing the Plus articles based on their length. This is the average per year. I will write as much as needed to explain the topic. The shortest article in 2015 is 'Tapping Into The Network Effect', which is only 19 pages long. The longest article is 'The Five Behaviors That Define The News Business', which is 43 pages long. But, on average, I have been focused on making each article more valuable, rather than focusing on the volume. So, you ask, does length have an impact on how popular an article is? Well, this is an extremely fascinating topic. You might think that the longer the article is, the less people would see it, but that's not the case at all for Baekdal Plus. There are two ways we can look at this. We can measure this in terms of unique views or in terms of reads. As you can see, the longest article was also the one that got the most amount of views (by far). It was super popular. But there is no correlation between how long an article is and how many views it is getting. It 100% depends on the content. Again, we see no correlation between the length of each article and the percentage of the people who decide to read it. But let's dig a little deeper. What if we include the free articles that I also publish, how do they compare? They are obviously much shorter in length. Well, let's take a look. As you can see, it actually looks like the Plus article are attracting more views, and a closer look at the data confirms this. 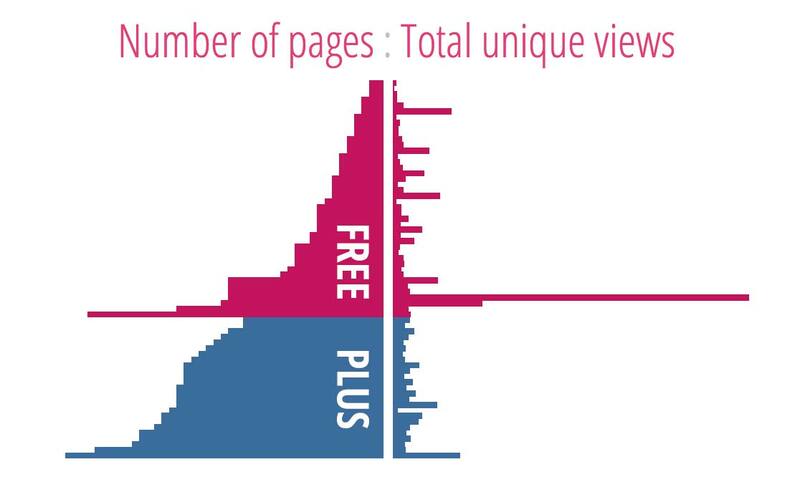 The Plus articles attract 54% more traffic in general than the free articles. It's a fascinating effect and it was something I noticed several years back. Why do the paid-for content that only some can see attract more views than the free articles that are available to everyone? The answer, of course, is that the paid-for content is more valuable (and that they can be shared). BTW: The free article with the huge amount of views is the one I wrote recently called 'Not Even Twitter Understands Twitter'. It easily outperformed anything else that I have posted this year. That was fun, although It is not the most popular article I have posted over the past five years (it's only in 18th place). The most popular article overall is 'How In-app Purchases Have Destroyed The Industry' with more than 800,000 views. 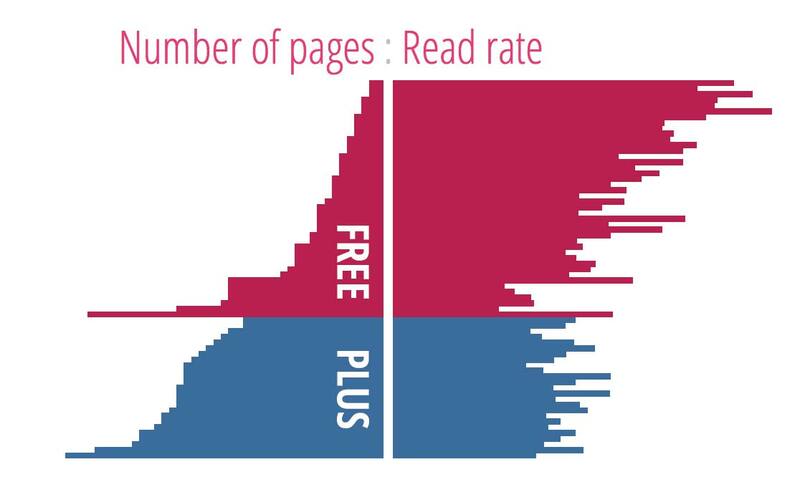 We can also look at this in terms of read-rate, and here we do see a very strong correlation between the length of the free articles and the read-rate. But look at the difference between free and Plus. The decline in read-rate (which is dropping by about 10% for every two pages each article is longer) completely stops as soon as it becomes a plus article. The reason for this, I believe, has everything to do with intent. The free audience is dominated by people who just happened to see a link to one of the articles somewhere, but they don't have any specific reason or intent when they arrive. As such, they just react and, the longer something is, the more likely they are to leave without reading it. I see this very clearly with the Twitter article. It generated more traffic than any other article, but the conversion rate is almost zero. The Plus articles, however, are read by an entirely different group of people. Some of them are subscribers who have a reason for reading them, while the rest are people who come to the articles because it was recommended to them. As such, the intent is much, much higher and we don't see the gut-reactions of the free audience. This, of course, is just my theory for why it looks this way, but I find it to be absolutely fascinating. I see this not just on this site, but on many sites that I have looked at. There is a distinct difference in behavior between a free audience and a paid-for audience. And this difference has a huge impact on your editorial focus. What works for a free audience doesn't work for a paid-for audience, and vice-versa. Also, keep in mind that even though the read rate is higher for the free articles, Plus articles still generate more views overall. Note: Free articles have a 48% read-rate, whereas Plus articles has a 36% read-rate, on average. These were just a few insights into what is happening here on this site at its five year anniversary. I cannot express how thrilled I am at getting to this point, and also how thankful I am for all of you who have been subscribing over the years. I still dream about getting at least twice the amount of subscribers than I have today, and there is still a lot of work to be done. But getting this far and being at a point where it actually works financially is just a wonderful feeling.